This post consists of two parts. The first concerns what a chiton is and how it obtains its food. The second part (i.e., the next blog) concerns the rare presence of the world's largest chiton in a Pleistocene marine-terrace deposit in southern California. Chitons are animals that belong to phylum Mollusca. This phylum includes gastropods, bivalves, and cephalopods (nautiloids, squids, and octopus). 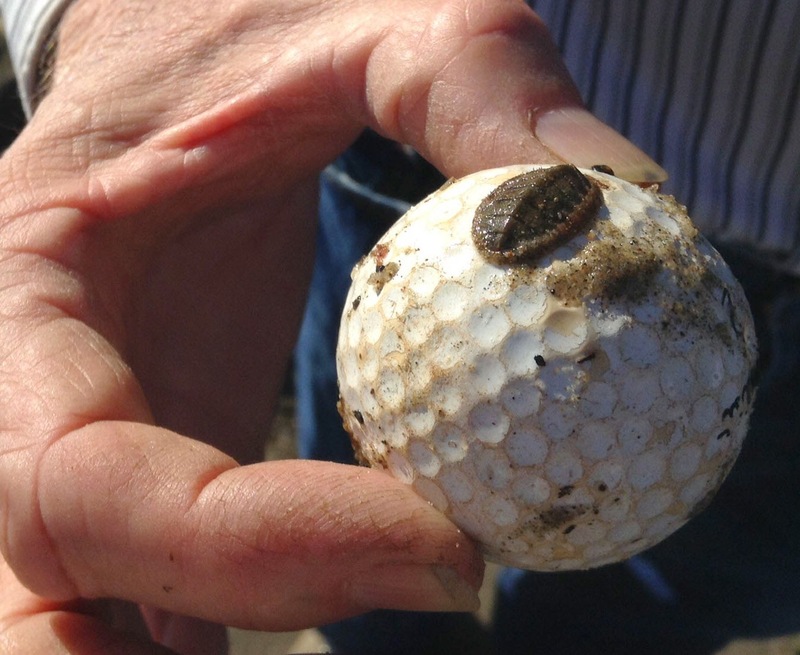 Chitons live on hard surfaces and cling tightly to them (even on golf balls--see above--that find their way into the intertidal zone of the ocean), but the animal is capable of a very slow creeping type of locomotion. 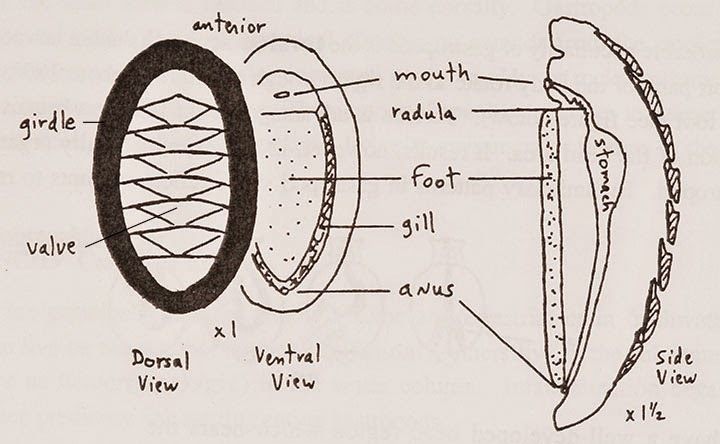 The morphology of a chiton is shown above. Notice that the shell (exoskeleton) part consists of eight valves (plates). The mouth has a scraping device called a radula, which consists of small teeth with hardened caps for scraping its food (algae) off of hard surfaces. Top side of limestone (19 cm long) found in intertidal waters. The above picture and the one following it show how effective chitons can scrape a rock-hard surface. The pictures show two sides of the same chunk of rock. The unscraped side never had a chiton living on it, whereas the scraped side shows how effective the grazing of a chiton can be. This is an excellent example of bioerosion. This chunk of rock came from Palau, in the South Pacific, and the scrape marks were made by another genus of chiton (chitons? ), other than Cryptochiton. Chiton-scraped, bottom side of rock shown above.